Ptosis is the medical term for drooping of the upper eyelid, a condition that may affect one or both eyes. Two types of Ptosis exist: acquired and congenital. If present at birth, this condition is referred to congenital ptosis. A person may also develop Ptosis from trauma, disease, or aging, and this type is considered acquired. Whether acquired or congenital, symptoms of ptosis include a decreased ability to keep your eyes open, eyestrain, eyebrow fatigue from the increased effort needed to raise your eyelids, and general fatigue, especially while reading. When the edge of the upper eyelid falls, it may block the upper field of your vision. 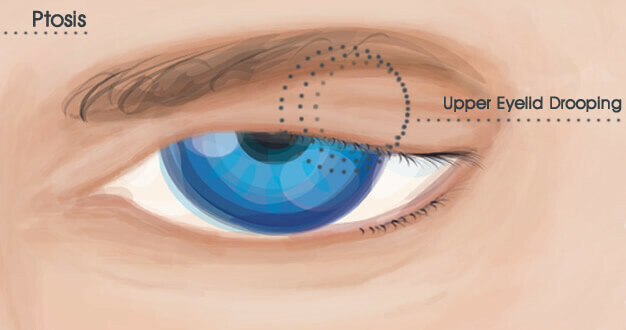 In severe cases, it may be necessary to tilt your head back or lift the eyelid with a finger in order to see out from under the drooping eyelid(s). You may also notice a tired appearance from "droopy eyelids" even though you feel well rested. Myasthenia Gravis Acquired ptosis can indicate the beginnings of myasthenia gravis, a disorder in which the body’s muscles become weak and tire easily. Horner's Syndrome Ptosis is also present in people with Horner's Syndrome, a neurologic condition that affects one side of the face and indicates injury to part of the sympathetic nervous system. What are the causes of acquired and congenital Ptosis? Acquired ptosis is most commonly caused by stretching of the levator muscle in the eyelid, the major muscle responsible for elevating the upper eyelid. Other causes may include interference with the nerve supply to the muscle or occur as a result of aging, trauma, muscular disease, or neurologic disease. As you age, the tendon that attaches the levator muscle to the eyelid stretches and the eyelid may fall, covering part of the eye. Patients may also develop upper eyelid ptosis after cataract surgery, which can sometimes cause the weak tendon to stretch. An injury to the oculomotor nerve (the nerve that stimulates the levator muscle) can potentially result in upper eyelid ptosis as well. This condition would manifest after a severe trauma to the eye's orbit that injures the tendon connecting the levator muscle to the eyelid. While the cause of congenital ptosis is often unclear, the most common reason is improper development of the levator muscle. What treatments are available for acquired and congenital ptosis? Acquired ptosis is treated surgically, with the specific operation based on the severity of the ptosis and the strength of the levator muscle. Surgery is designed to reattach the stretched muscle to its normal location. If the levator muscle is weak, a "sling" may be used to enable the forehead muscles to elevate the eyelid. If congenital ptosis is not severe, surgery is generally performed when the child is between 3 and 5 years of age. When the ptosis interferes with the child's vision, however, surgery is performed at an earlier age to allow for proper visual development. The main goals of ptosis surgery are elevation of the upper eyelid to restore normal field of vision and an attempt to achieve symmetry with the opposite upper eyelid. These goals depend on many factors and, therefore, may not always be possible to achieve. Surgery is usually performed with a combination of local anesthesia, which numbs the upper eyelid, and light sedation with oral and/or intravenous medications. Some patients may require general anesthesia, in which case the patient will sleep through the operation. Is Ptosis repair right for me? At Miami Eye Center, Dr. Joseph Selem will meet with you during your private consultation to assess your individual situation. Dr. Selem can help you decide if Ptosis repair in Miami is right for you. See the beauty in yourself and the world around you in crisp, clear detail today! Request an appointment online or call Dr. Joseph Selem and the staff at Miami Eye Center at 305-444-0221 to schedule your private consultation.